Woubi Mengistu is the national manager for health and social protection for Samaritan’s Purse in Uganda and is currently representing Samaritan’s Purse in Burundi. In April 2015, Burundian President Pierre Nkurunziza announced that he would seek a third term in office, despite the constitutional two-term limit. On May 13, an attempted coup was carried out in the country, which was followed by unrest and conflict in the capital and other parts of the country. Since then, thousands have fled their homes to seek safety in neighboring countries. 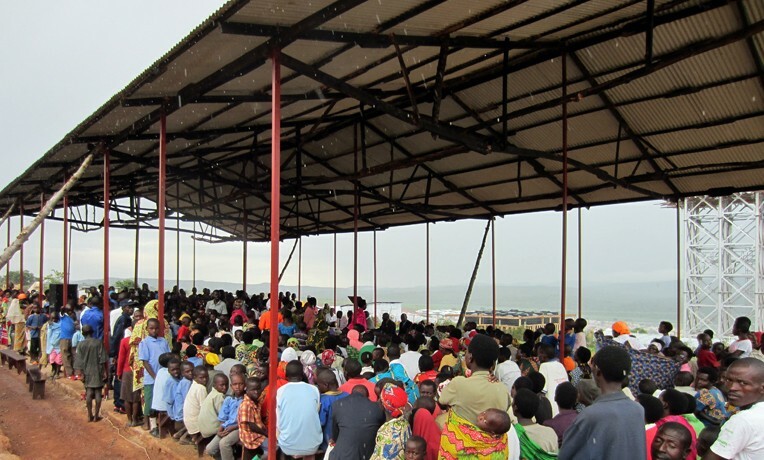 Currently, Rwanda is hosting more than 69,000 Burundian refugees. More than 45,000 of them reside in Mahama Refugee Camp. Recently, I woke early and drove from the Rwandan capital to Mahama Refugee Camp to attend a Sunday service with the Burundian refugees. After 2.5 hours, we reached Mahama Deliverance Church, which was filled with more than 750 worshippers. Samaritan’s Purse has worked in partnership with other ministries to construct a church building adjacent to the refugee camp. Before the church was constructed, refugees were attending services on the field, under a scorching sun, where the church structure now stands. The political turmoil in Burundi is still going on, and more refugees are expected to come to the camp before the end of the year. Those who are running the church are concerned that there won’t be enough space to accommodate the newcomers. They hope to expand the church but must trust God for the provision. When I reached the church, a young lady named Amina was giving a testimony about how Christ had changed her life. Amina left her husband behind in Burundi and fled to Rwanda with her two daughters. She was a Muslim before she came to the camp and received Christ in the camp after church members visited her. I was encouraged by her testimony, especially hearing how the persecution she endured from her Muslim friends and families and the challenges she faced didn’t take away her joy. The singing, dancing, and ululation of the congregation astonished me. Their joy was a clear message to me that joy is a gift from the Lord, which doesn’t depend on circumstances. These people have traveled long distances, left behind the villages they grew up in, and ended up in a foreign country. I had an opportunity to greet the congregation, and the Word that came to my heart was Philippians 4:4: “Rejoice in the Lord always. Again I will say, rejoice!” Apostle Paul, despite having been thrown into jail, was encouraging Christians in the Church of Philippi to have joy in what the Lord has given them, not in temporary circumstances. I don’t know to what extent my words encouraged the congregation, but I was sure of one thing—they were already joyful.